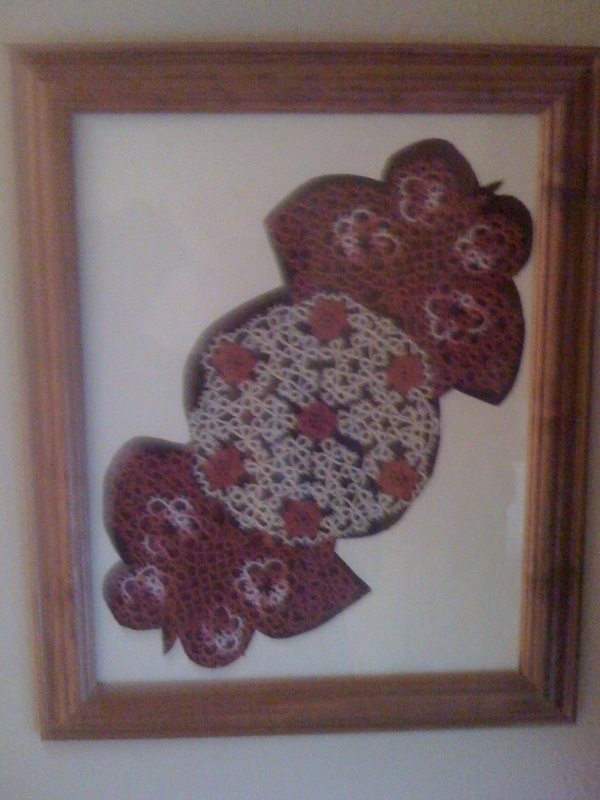 Updated 3-3-14 " My Finished Christmas Present" from 2013 hand made by my Mother Shirley Stubblefield. 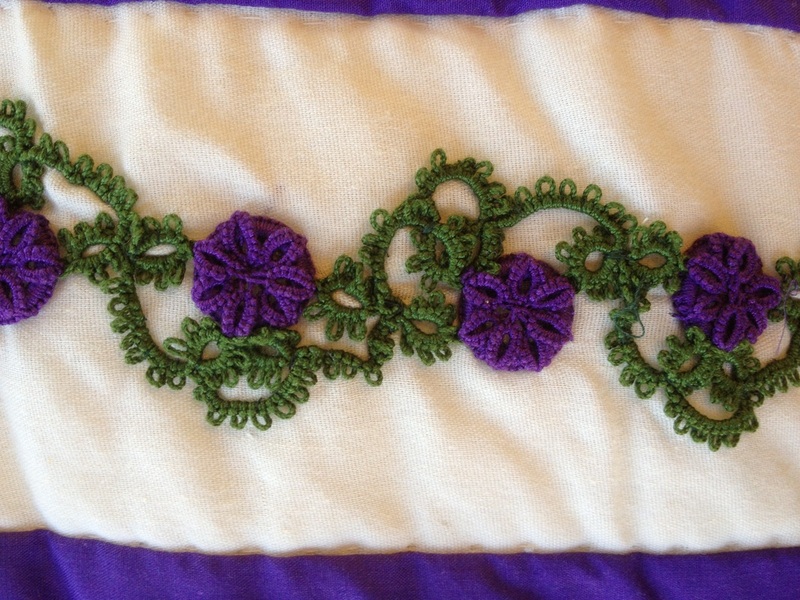 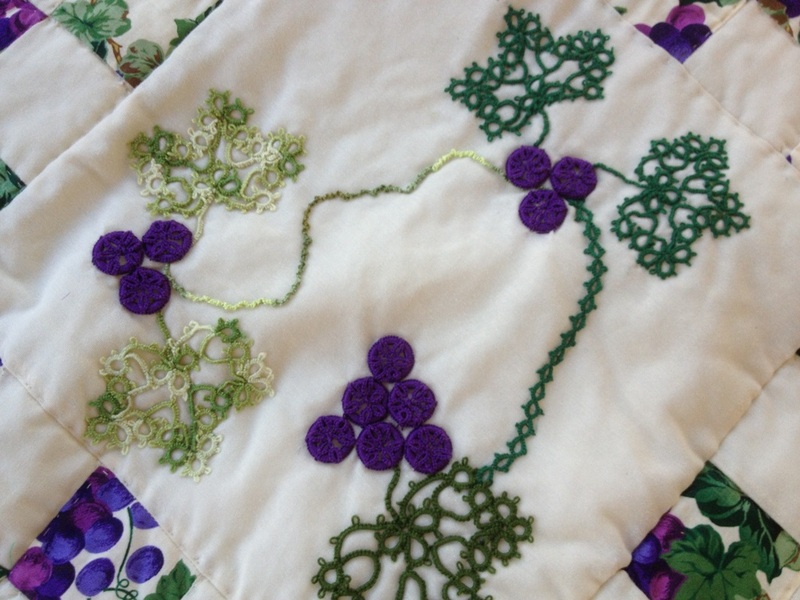 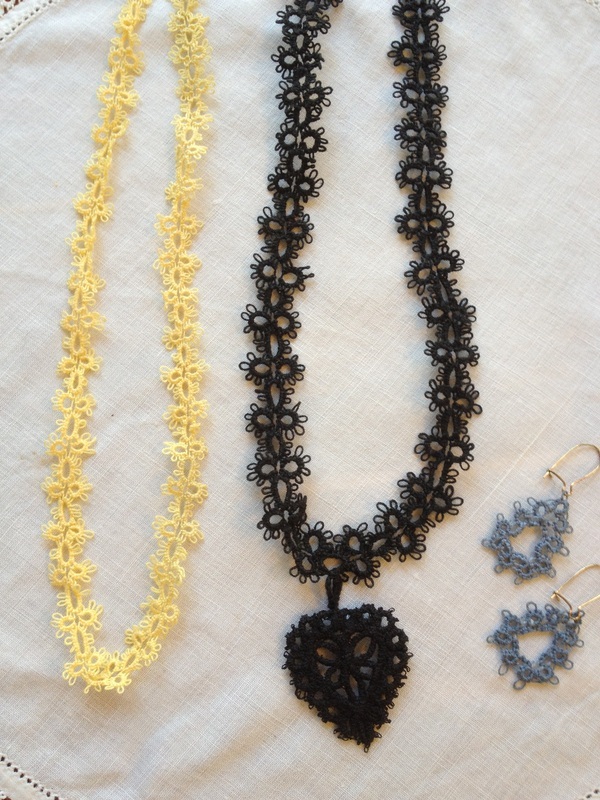 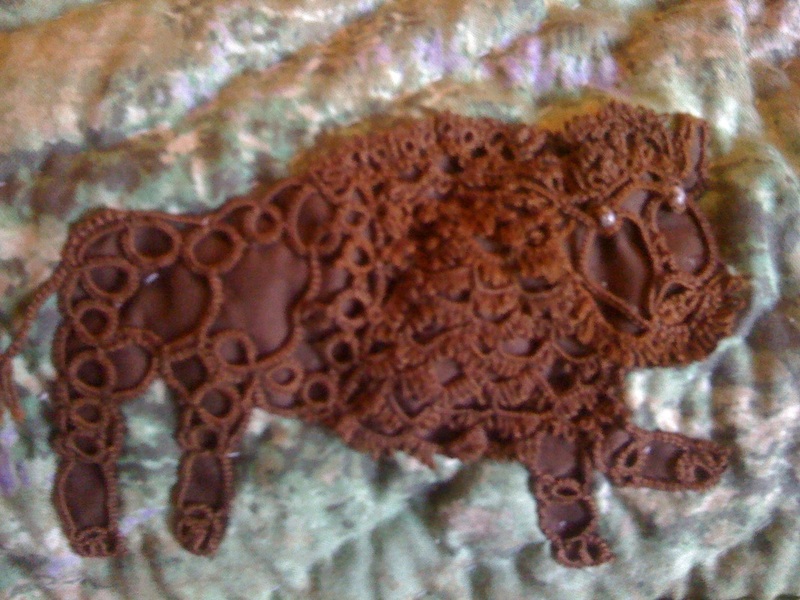 I call this a "sample quilt of tatting". This was a wonderful gift to my sister-in-law and I. 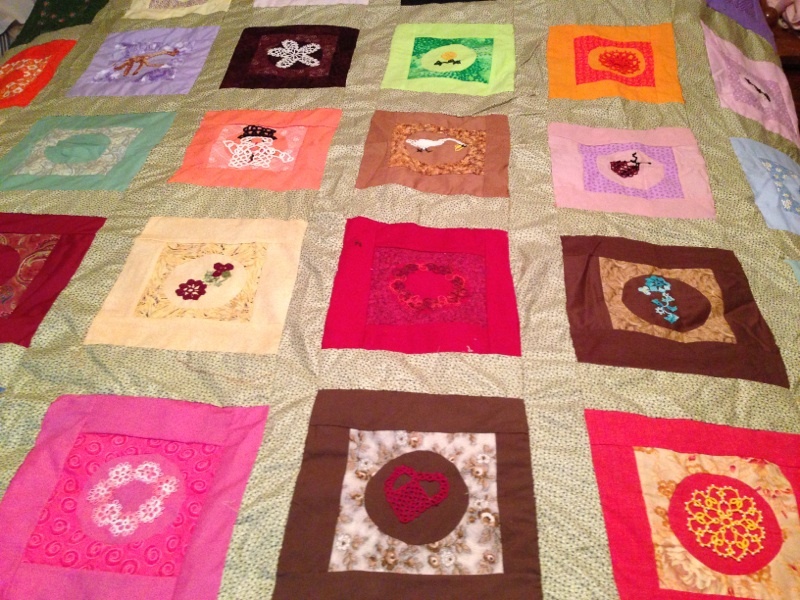 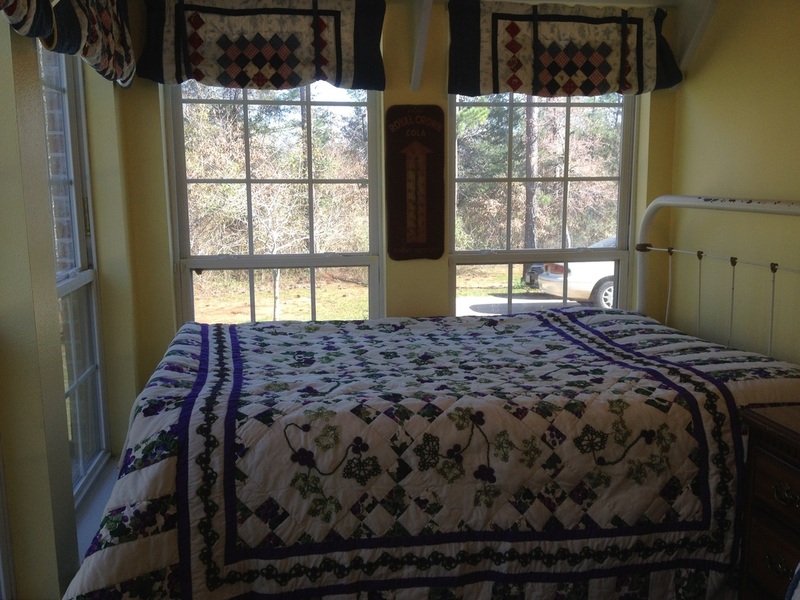 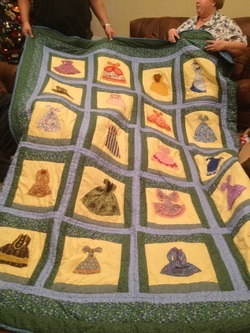 My Mother made two hand quilted Gone With The Wind Quilts. 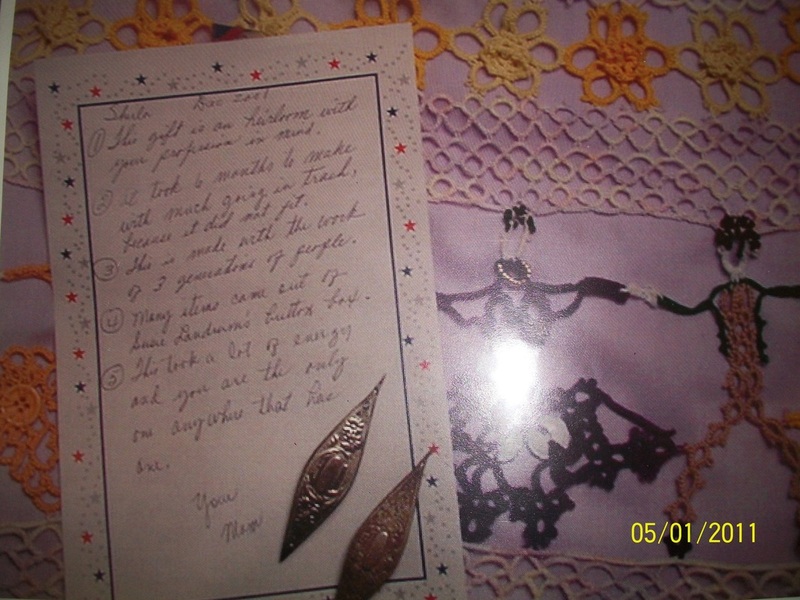 This was priceless gift and a treasured heirloom. 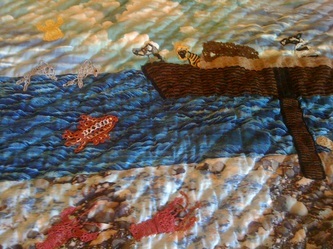 Ark was mother's pattern. 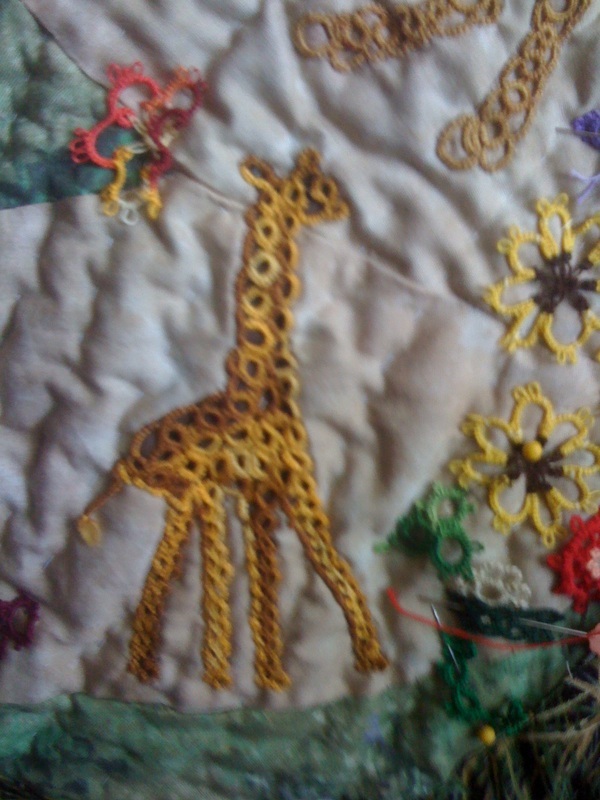 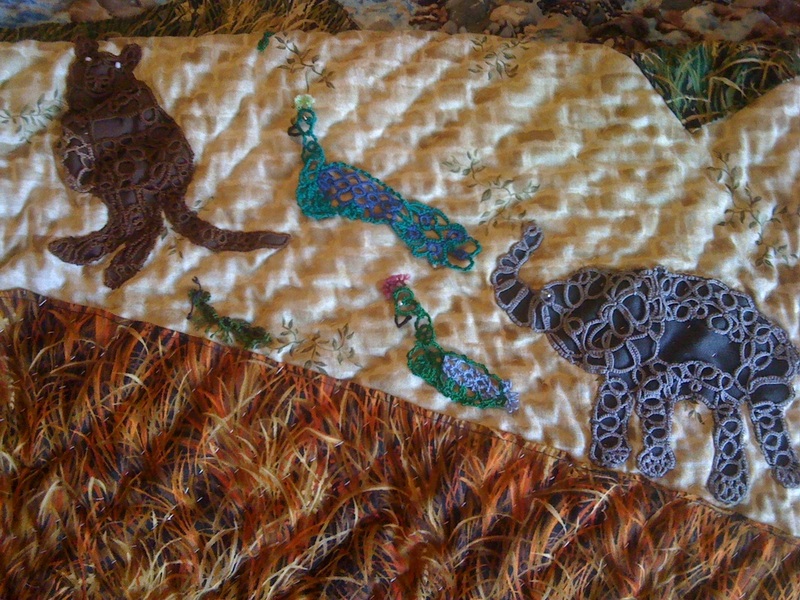 Giraffee pattern is from Jane Enbroll. 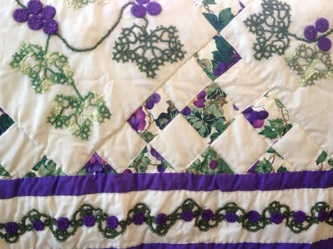 German patterns given from Christel Wiedmann. 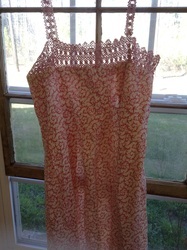 Unique Tatted Vest made by Shirley Stubblefield. Made with tatted people and with parts of my grandmother's tatting she had not finished. 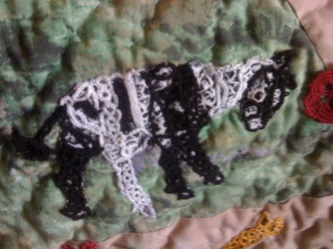 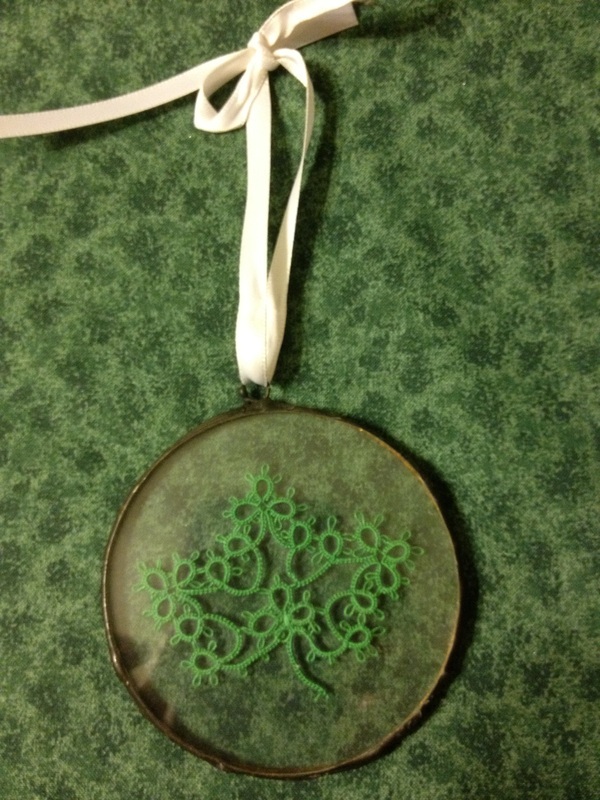 Blended with buttons from her old button jar. 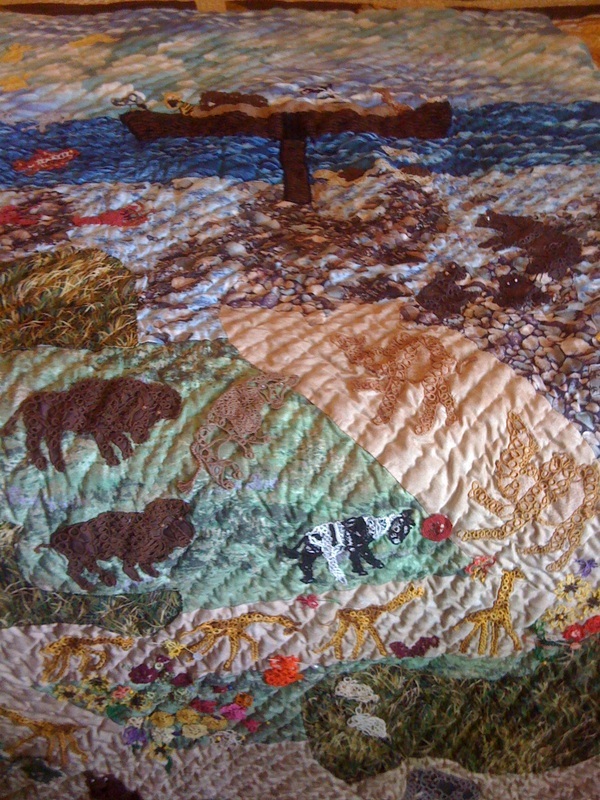 Christmas gift to me from my Mother 2001. 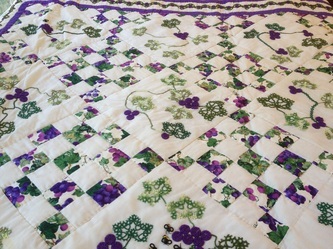 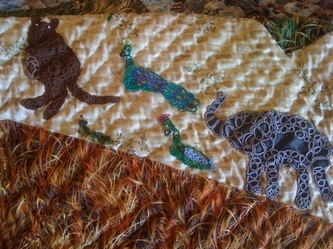 Grapevine Tatted Quilt made by my Mother Shirley Stubblefield. 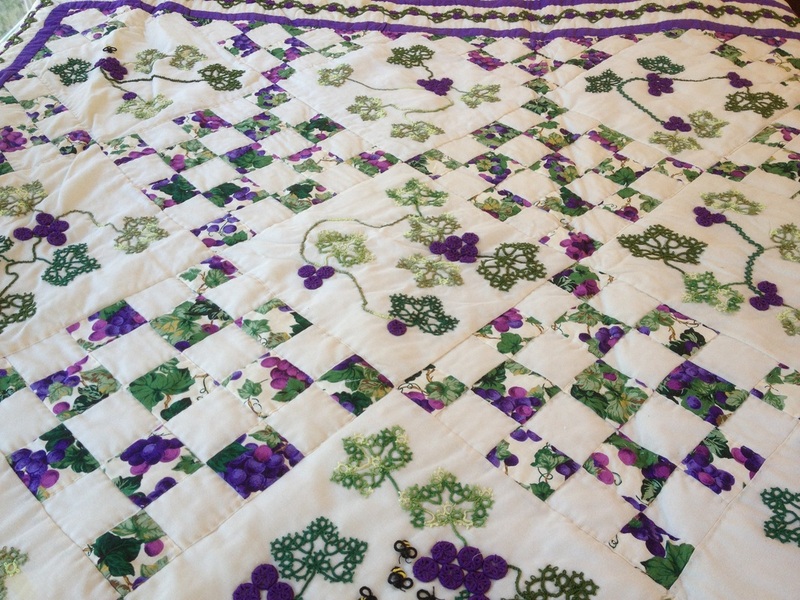 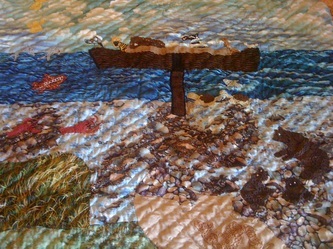 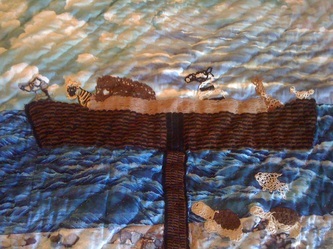 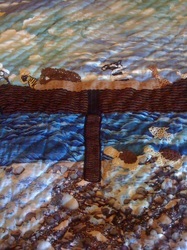 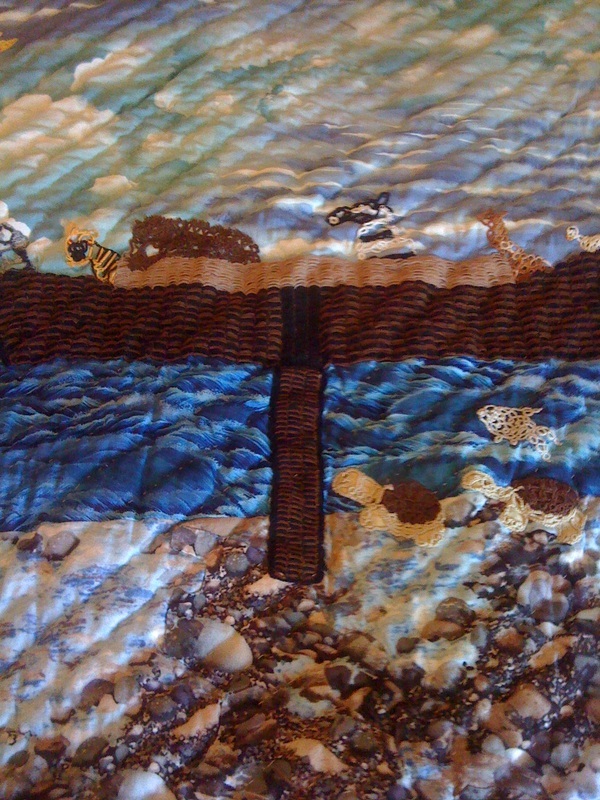 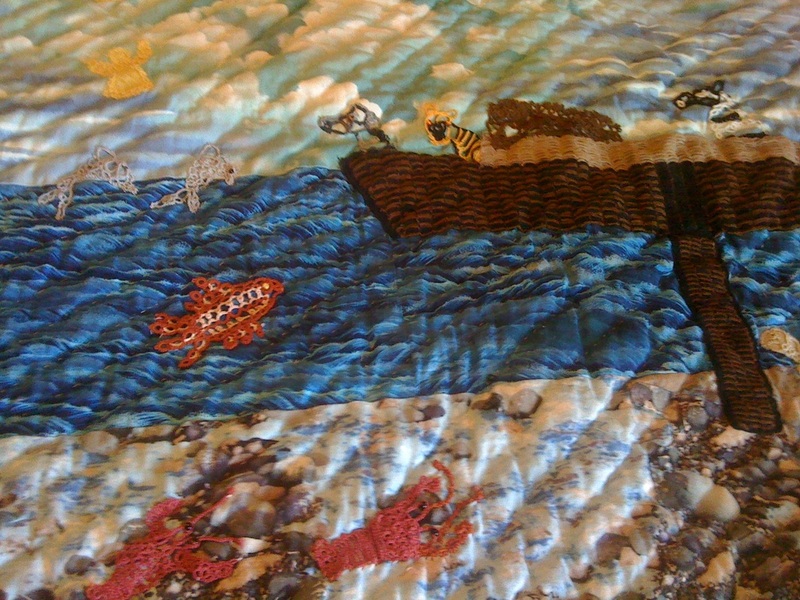 There were a lot of details that went into this quilt. The cobone rings were Sadie Allison's pattern from her book. 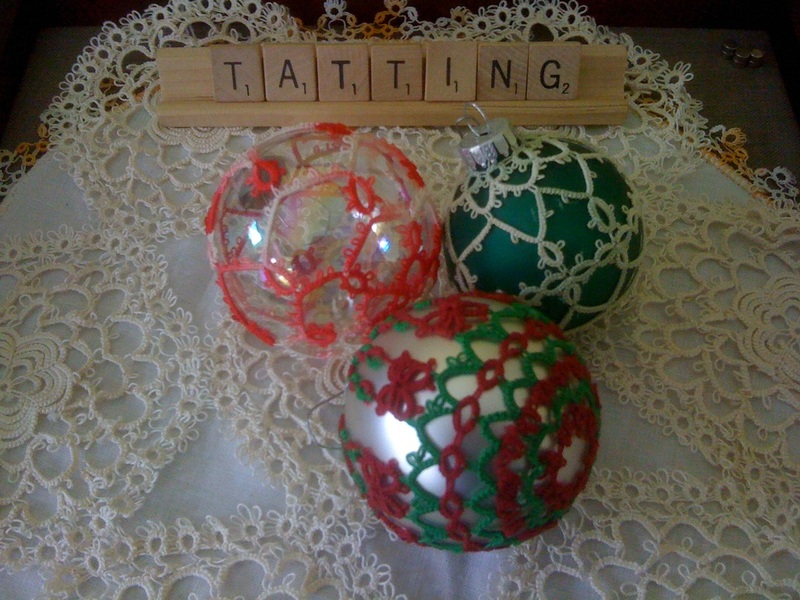 Tatting over a Cobone Ring A differnet Look For An Old Art. The leaf and other patterns are unknown. 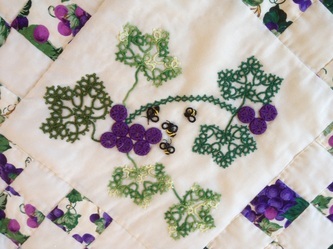 Tatted Bees pattern came from someone in Colorado. 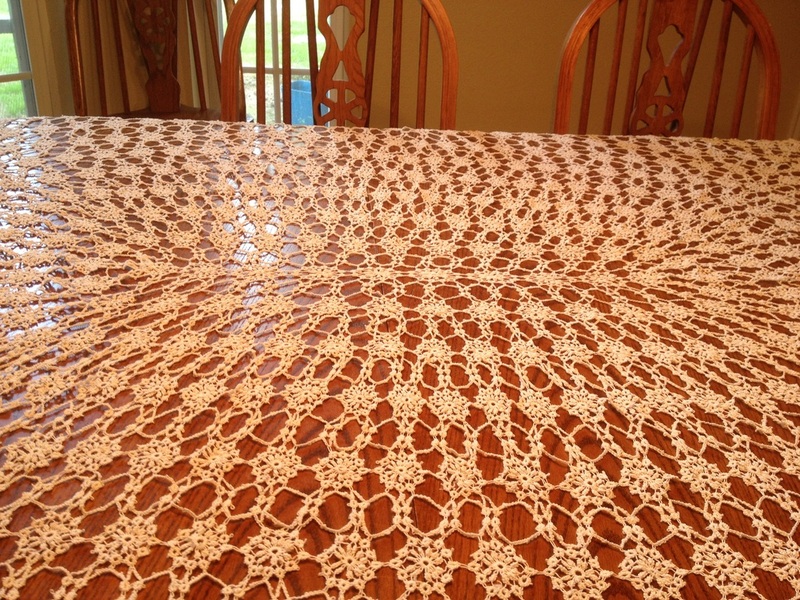 Tatted table cloth made by Susie Landrum my grandmother. 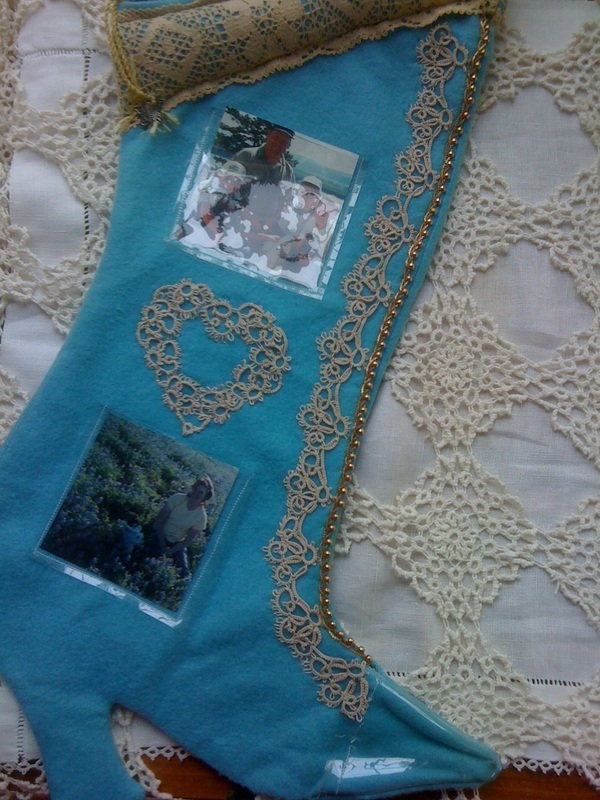 She made all of her grandchildren one. 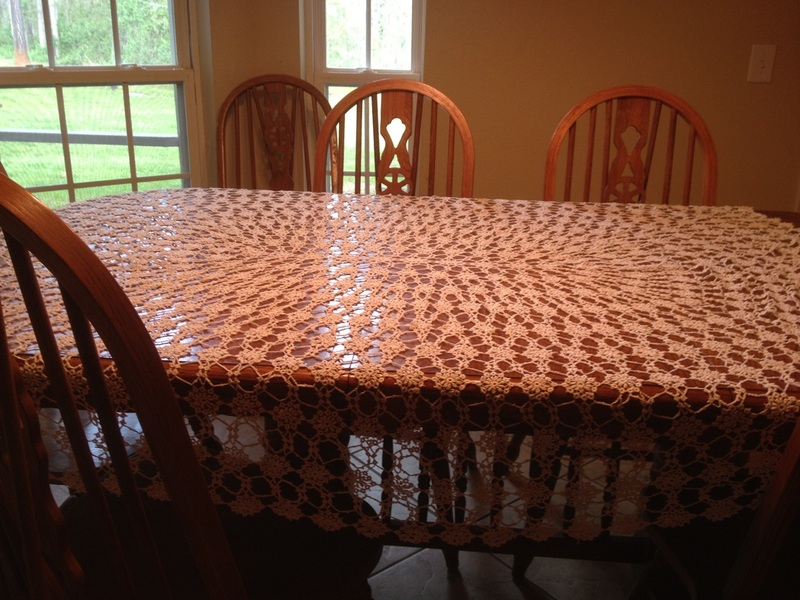 If you view my wedding pictures you can see the table cloth being use. I used it as curtain in my kitchen until Sadie Alllison said "Girl you just do not what you have, you don't see large pieces like this." I took it down and it is properly stored today. 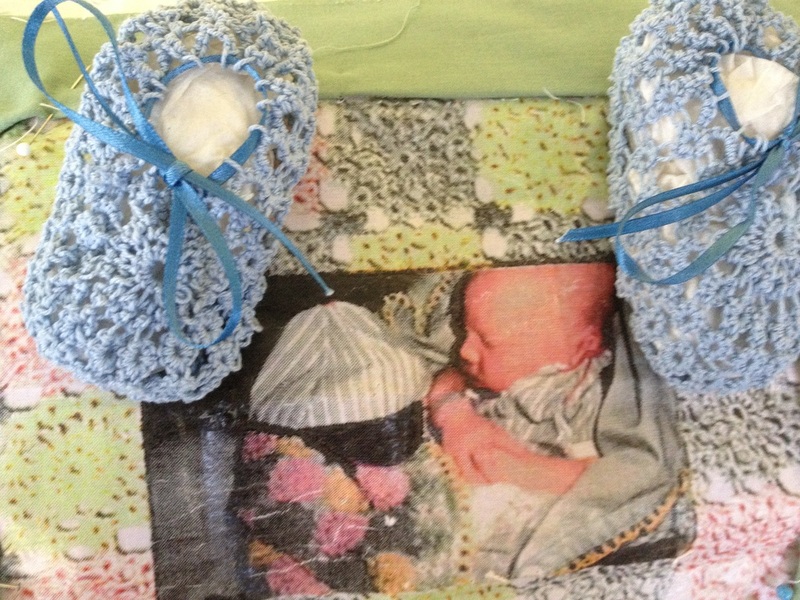 TATTED BABY BLANKET AND BABY BOOTIES MADE BY SUSIE LANDRUM MY GRANDMOTHER. 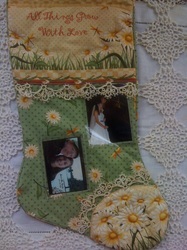 THE PICTURE IS MY SON JEREMY. 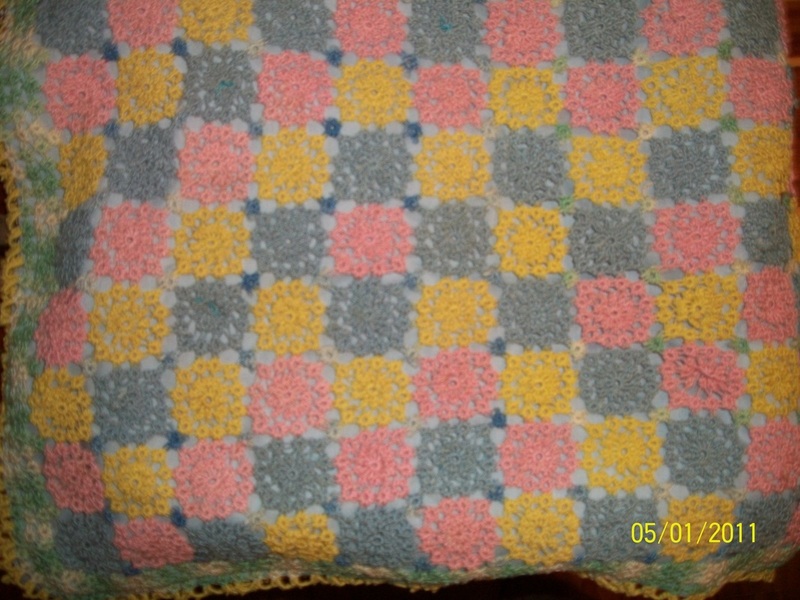 Baby blanket and blue baby booties was made by Susie Landrum my grandmother. 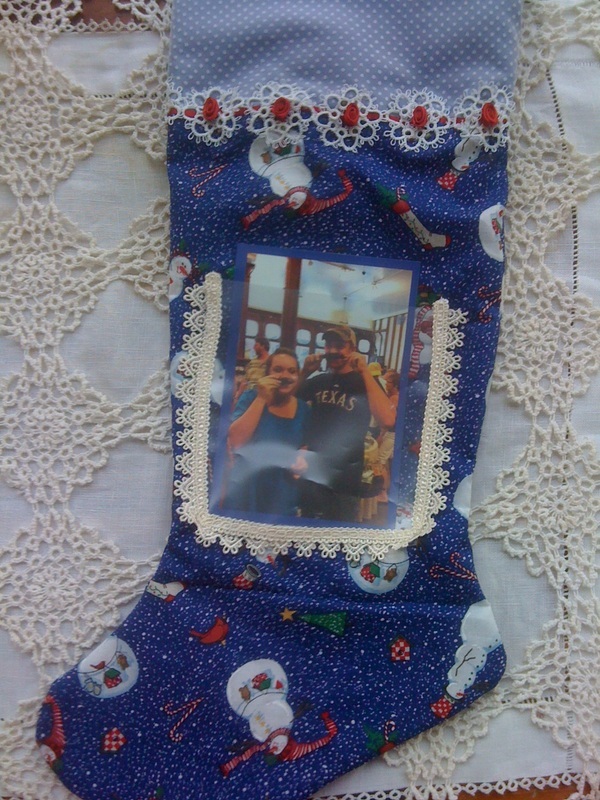 My sons came home from the hospital wearing them. 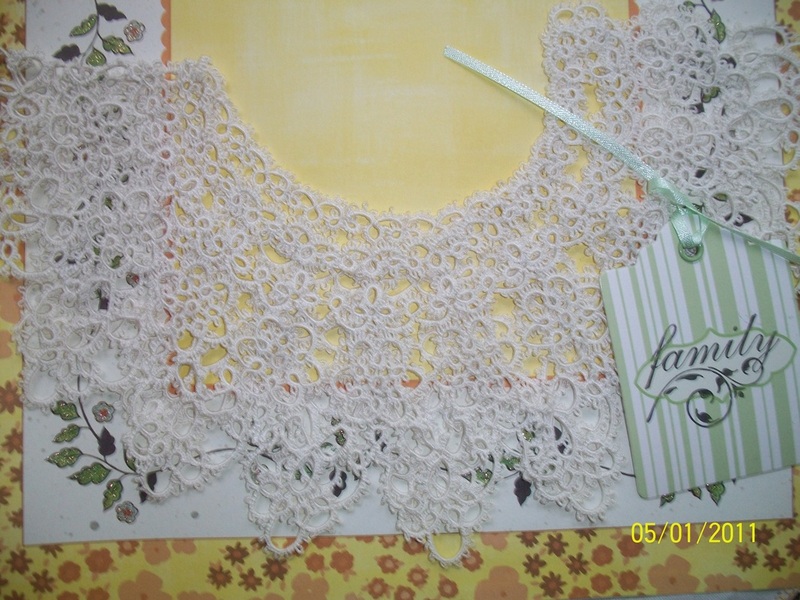 Tatted collar made by Bessie Henderson my Aunt. 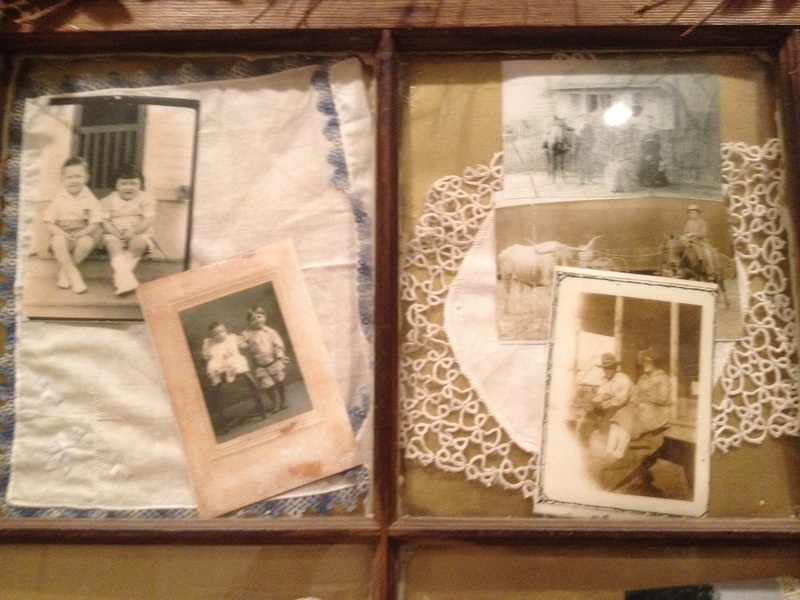 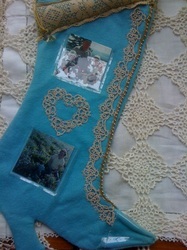 Old window with vintage tatting hankies and generational photos. The hankies was from our family vaction. 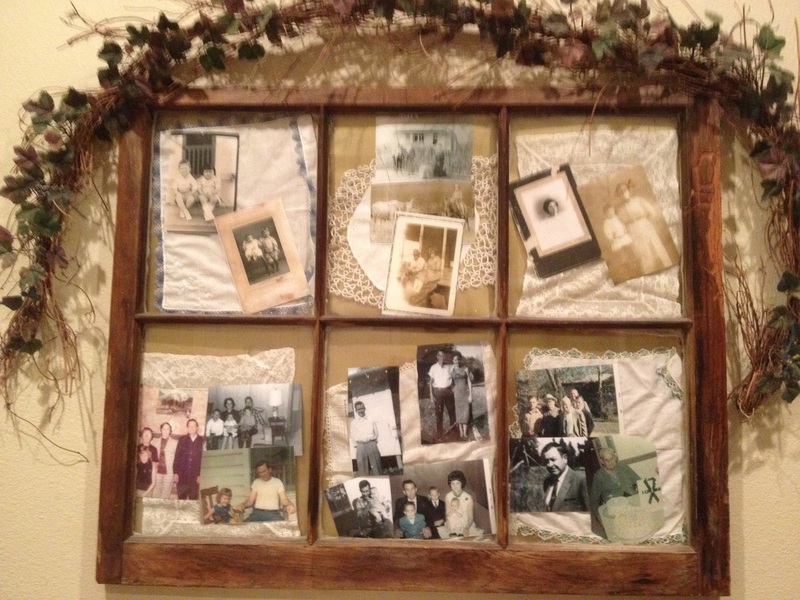 Pictures of my dad and his family.